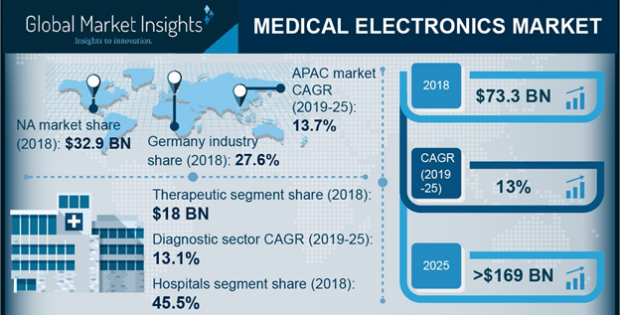 Global Medical Electronics Market is set to exceed USD 169 billion by 2025; according to a new research report by Global Market Insights. Growing preference for minimally invasive surgeries will foster medical electronics market growth during the analysis period. Adoption of medical electronic devices such as patient monitors and other diagnostic devices is specifically high in minimally invasive surgeries. Minimally invasive surgeries are safe, patient-friendly and cost-effective. 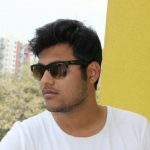 As a result, these techniques are being adopted across various healthcare fortes that have positively impacted the demand for medical electronic devices. Moreover, regulations implied on the manufacturers of the medical electronic devices ensure superior quality of technologically upgraded medical devices that further raises its adoption in surgical procedures escalating the industry growth in foreseeable future. Technological advancements in medical electronic devices will trigger the industry growth over forthcoming years. Key industry players constantly focus on integrating advanced technology within the devices that enables accurate and efficient diagnosis as well as treatment. Also, government in emerging economies implement several decisions such as price reduction of medical electronic devices. Such decisions positively impacts the demand for medical electronic devices by resolving the affordability issues. However, stringent regulatory scenario and trade policies associated with medical electronic devices will hamper the industry growth to some extent. Companies partaking in medical electronics industry have launched novel implantable medical electronic devices for therapeutic treatments of Huntington, Brachycardia, Lou Gehrig, Parkinson, Tachycardia, muscle spasticity, deafness, irregular breathing problems, and chronic pain. Furthermore, the launch of implantable electronic products such as cochlear implants, neurostimulators, drug pumps, monitors, and delivery systems have led to intense competition between companies, to take the innovation levels a notch higher. The medical electronics market is already ablaze with numerous R&D activities intending toward designing contemporary products for specific disorders. In fact, medical researchers have already been experimenting with electronic retinal implants for treating partial blindness. The deployment of semiconductor technology in medical equipment design has had a profound impact on the profitability scale of medical electronics market. The rising preference for portable medical devices and home-based healthcare will further lead to the development of next-generation monitoring & testing equipment ensuring accurate medical test outcomes. The escalating requirement for products endowed with exceptional functionality, low energy consumption, and manufacturing ease is projected to produce a profitable roadmap for medical electronics market in the near future. Hospitals, clinics, and ambulatory surgical centers essentially comprise the end-use spectrum of medical electronics industry. These medical care centers have been attempting to heavily upgrade their healthcare services & operational efficiency coupled with reduced treatment costs – which would ideally be accomplished via extensive deployment of medical electronic devices. These devices boast of the ability to provide high-quality healthcare solutions in hospitals and clinics, owing to which their deployment would bring about a profitable impact on medical electronics market. Medical electronics industry has substantially established its presence across key geographies such as North America, Asia Pacific, Europe, Middle East & Africa, and Latin America. The huge presence of reputed firms involved in the production of medical electronic devices, accompanied by the launch of advanced technologies in the healthcare sector will combinedly augment U.S. medical electronics industry. Having contributed to more than 90% toward North America medical electronics market share in 2016, the U.S. industry is expected to be driven by the massive healthcare coverage under the Affordable Care Act and a favorable regulatory landscape. Another lucrative growth avenue for medical electronics market has been touted to be Germany. Having been endowed with favorable import policies, the country is all set to strengthen its presence in medical electronics industry. The growing trend toward the use of technologically advanced product will further stimulate the regional growth, state analysts. Major firms such as GE Healthcare, Siemens AG, Fujifilm Holdings Corporation, Medtronic, and Carestream Health have been investing in R&D programs to launch new products for expanding their product portfolio. Further on, companies have been collaborating with local players to reinforce their brand presence across medical electronics industry, which would eventually help augment the revenue graph of this business vertical. Quoting analyst predictions, medical electronics market will grow at a rate of 12% over the coming seven years, having held a valuation of close to USD 60 billion in 2016.